Pretty good. I had high hopes, as I really enjoyed the first book in the series--this one did not come up to that level for me, but I did like it.Cassandra, the heroine, has a life changing experience at the beginning of the book. She finds out that the people she believes to be her parents were actually her adoptive parents, and that instead of being the child of a wealthy merchant, she is actually the granddaughter of an earl, and is his sole heir. Of course, the laws being what they are, she cannot inherit his entailed property or his title, so the earl has decreed that she marry his male heir, Cassandra's cousin.Of course, this does not suit Cassandra; she is attracted to a marquess, Simon Fitzgerald. The action in the middle of the book was slow; Cassandra's rebellion against her grandfather took a long time to develop and she was slow to realize she really loved Simon.The ending was fun. I liked how Simon's sister stepped in and interfered enough to secure her brother's happiness. Wow! I just love this series. 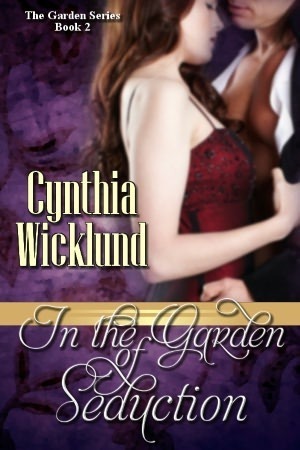 In the Garden of Seduction is the 2nd installment of The Garden Series by Cynthia Wicklund. I read the first book In the Garden of Temptation after finding it on Amazon in ebook format. I'm so glad I gave it a chance because now I'm hooked.Cynthia Wicklund has done another incredible job with this fantastic historical romance. Like the first book, I fell in love with the characters. Cynthia Wicklund created clever plots with both books, and I'm excited to start on the third installment, In the Garden of Disgrace. In the Garden of Seduction is a perfect balance of plot and seduction. Cynthia Wicklund gives you just enough to keep you satisfied and to keep you turning the pages, and then you are highly rewarded in the end.I highly recommend this series.Thanks to Cynthia Wicklund for another great read, and happy reading to the rest of y'all. I really really enjoyed the first book in this series. But once you've read that one ... the rest don't seem as good, or they all seem the same. All the men seem to look the same, black hair with blue eyes ... they all need to be saved from themselves by these strong women. I like the story line and have enjoyed reading all of them, but none of them are like the first one, which I really thought was amazing. It's the women in these books that set them apart ... good thing I liked these women. Cassandra is the female lead in this book. I thought she was wonderful and enjoyed reading about her in book 3 as well. She goes through a lot in this book ... finding out about her family, having her future planned out for her, family threats ... it's fun and suspenseful and I enjoyed reading her story. I enjoyed Cynthia Wicklund's In The Garden of Temptation so went straight to #2 The Garden of Seduction and it is even BETTER than the first one. The author creates a plateau of sexual tension, desire, and longing unlike I've ever experienced. The heroine is admirable, smart and having an almost impossible time keeping the handsome rogue of a hero off of her. Adopted, she discovers she is the granddaughter of the head of an ancient and aristocratic family who plans to betroth her to his nephew purely for blood lines. She hates her new family and resists all attempts to reform her into a proper lady. The Handsome young rogue falls madly in love with her and becomes her advocate in resisting the tyrannical dictates of her powerful grandfather. This is the second in a series... it didn't have any connection at all to the first book other than the general time, location and title, which was a great dissappointment to me :( I would have liked to have seen something with the secondary characters of the first book. But I did like this one. There is an opening for a book that maybe the author could bring the secondary characters from both books together in the third book... too much to hope for???? I think so too. The price is right for these if I get mad and stop reading!!! But so far I've kept up and only hollered at the nasty old man in the book a couple of times!! I'll try the third book. This is the second in the garden series. It is different from the first one, and I was disappointed that the characters were not related. This book was very much a fantasy. Cassandra seems like a headstrong woman, and I want to believe her but the author makes her weak. She gives in when the entire book is about how much she refuses to give in. I was almost disappointed when they inevitably got together. GOOD READReally enjoyed this book. It showed how family tried to put expectations for future before happiness. Also how people will rebel such as Cass did and her father before her. Book 2 in The Garden Series. If you love rakes, you'll love Simon Fitzgerald who is a master of seduction who always gets his way with women -- until he meets Miss Cassandra James, a lady with scruples who sees Simon for who he is. In the end though, she discovers the man camouflaged by his seemingly wastrel lifestyle and discovers the man beneath the trappings of callousness and class.Great journey from enmity to happy ending which will delight you. 2.5 Stars. A weak book. Cassandra was whiny and indecisive. Simon was obnoxious at first, but improved through the story. Why he kept his attraction to her is beyond me. The plot had potential, but did not flow well. Pretty entertaining - quick, mindless, romance novel - nothing much to it. A better novel than the third one in the series. However, once again annoying heroine whom I just wanted to slap!